Oral contraception is a popular form of birth control but many women find that it alters their headache or migraine pattern or even prompts new headaches where previously there were none. Some women are fortunate in that they actually experience less frequent headaches after commencing birth control. Still others find that the intensity diminishes and for some women there is no change and they continue to search for effective migraine treatment. Overall, more women will begin to experience migraines after starting oral contraception and this would indicate that there is probably a link between the two. Those who also show a familial history of migraines may be further predisposed to these types of headaches and should approach oral contraception use carefully and with additional medical supervision. When migraines do occur in women who take oral contraception, treatment is generally the same as that recommended for women who are not taking the pill and who experience migraines coinciding with menstruation. If you tend to experience migraine attacks around the same time each month, you can use a preventative approach and take prescription medications a few days prior to the expected attack. Oral contraception tends to regulate a woman's menstrual cycle so it can actually be easier to predict the onset of a migraine attack each month. If medications aren't effective, however, your doctor may then recommend a different oral contraceptive pill or a new form of birth control entirely. You may also find that if you do stop oral contraception, it can take several months or longer for migraines to completely stop. Your hormones can take time to adjust and each woman will be different in adapting. Your migraines will either stop or return to the original pattern experienced prior to starting oral contraception. 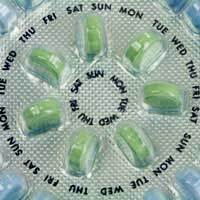 Should I Stop Taking the Pill? It's not wise to stop your method of contraception without first consulting your doctor. There are many other options, including various types of oral contraception as well as non- oral birth control methods. Your doctor can discuss the appropriate choices for you, which will depend on many factors such as your age, family history and any health conditions or risk factors you may have. Sometimes trying a birth control pill in a different dose or an alternate form of oestrogen can improve headaches. It can, however, make migraines worse so it is essentially trial-and-error when finding a type of oral contraception that is compatible with your body. If you find that your migraines increase or only strike during your pill free week, you may have the option of taking oral contraception constantly. If this is the case, you would simply eliminate the week where you consume a placebo pill or no pill at all. You may experience other side effects such as spotting if you do switch to a constant cycle of oral contraception, but most women will find that this resolves after several months. Care should be taken because recent studies have linked migraines to an increased risk of ischaemic stroke. The risk is also higher in migraine with aura as opposed to migraine without aura. Since oral contraceptives do increase the risk of stroke in those who don't experience migraine, this risk is compounded when migraines are added to the mix. The risk of ischaemic stroke is usually higher in older women and your doctor will assess your health, age and other risk factors to determine if oral contraception will substantially increase your risk of ischaemic stroke. Factors such as smoking and cardiovascular conditions combined with the presence of migraines may mean that oral contraception is not right for you. Birth control is important for any woman wishing to avoid pregnancy. If your oral contraception is making your migraine headaches worse, however, you may need to look to other ways of preventing pregnancy. You should not be alleviating a pregnancy concern only to replace it with a monthly dread of migraines. A discussion with your doctor and perhaps some trial-and-error will hopefully help you to find the right contraceptive method that allows you to enjoy migraine-free living. Does Using Electronic Devices Cause Headaches? What is a Subarachnoid Haemorrhage? I started getting migraine with aura at the age of 13. Their frequency decreased from 2 big attacks a year to 1 every 18 months-2 years once I was around 22 years old. I started taking the CHC at 24 (Norimin) and during the 6 years that I was taking this pill, I only had 3 migraine attacks. 1 lasted for 4 days, but not intensely after the initial awful 24 hours. I was put on Cerazette POP last July and I wish I hadn't been because my period now lasts 3 weeks each month! I don't really think that I am a candidate for only taking POPs as my migraines have never been frequent. My gynaecologist has just confirmed this fact. I understand my GP's caution but maybe she was over-cautious?